FERGUSON, Mo. - Some 200 protestors gathered in front of Ferguson Police Department Headquarters one year after a grand jury decided not to indict former Ferguson police officer Darren Wilson for killing unarmed 18-year-old Michael Brown Jr. 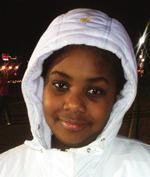 The scene was completely different from a year earlier and during the civil unrest after the teen’s death. 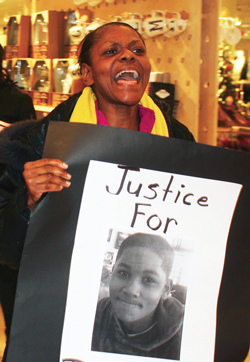 Protestors disrupt Black Friday shopping at St. Louis Galleria holding sign of 12-year-old Tamir Rice. A year earlier police officers from different jurisdictions, county police officers, National Guardsmen, armored vehicles, tear gas, high-powered rifles, burning buildings, demonstrators and arrests were all in the mix. This evening though demonstrators chanted, marched and expressed outrage verbally throughout the night, there were no confrontations with officers and no interference from law enforcement. Among protestors were community activists Anthony Shahid, Zaki Baruti, and Rev. Starsky Wilson, co-chairman of the Ferguson Commission and pastor of St. John’s United Church of Christ in nearby St. Louis. 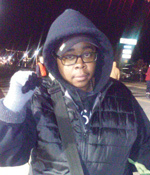 The Ferguson Commission was formed November 2014 by Missouri Governor Jay Nixon to study the underlying social and economic conditions that sparked unrest in Ferguson in the wake of the Brown death. The cornerstone of the commission’s work was that it would be open and transparent. Rev. Wilson, however, expressed dissatisfaction with some aspects of the commission at a nonprofit’s awards dinner four days prior to joining protestors on Nov. 24. “The way it usually works is that you give us space for people to come out of the streets to the table. You give a time for people to calm down. Then you negotiate with them long enough, and you look like you’re getting something done and then you go away and you don’t do the stuff that you told them you were going to do in the first place. 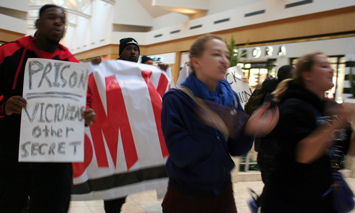 Tef Poe (center) leads protestors to shut down St. Louis Galleria on Black Friday. You produce a report that sits on the shelf somewhere and it doesn’t have any bite in it because it is staffed by those who are just arms of the state anyway. And it can’t be independent and it can’t be objective because everybody who gets a signature has an interest in getting a check from the same system who assigned them. I don’t want to be a part of that,” said Rev. Wilson. Others don’t want the commission used to undercut actual demands for justice. “In 1967 the Kerner Commission was put together to address the rebellion among Blacks and racial issues in America. All they did was gather information about stuff we already knew. We, Blacks and Whites, don’t get along well at all. Police brutality is not going to end until we stop it. I feel that what’s happening in Ferguson is no different than it was back in the 60’s when the Kerner report made recommendations but gave no solutions to the problems. Nothing was done then and I just don’t see nothing being done now, but I’m still hopeful we just have to see,” said Mr. Baruti of the Universal African People Organization. “One year later we fought, we fought, and we fought! This night we stood up under this season greetings sign and we were tear gassed and hurt. And we are still being oppressed today of all days we are not only thinking about Mike Brown, we’re thinking about what’s going on in Chicago. We’re thinking about that young man that was shot 16 times. We’re also thinking about those five protestors that were just shot in Minneapolis. All of this at the exact same time we should be at least celebrating some type of victory but we are actually going the opposite direction,” said Pastor Cori Bush of Kingdom Embassy International Church. The disturbing video of Chicagoan Laquan McDonald’s death was similar to video shot in St. Louis 10 days after Mike Brown was killed. A 25-year-old Kajieme Powell stood approximately 12 feet away from two police officers when he was shot 15 times. He had a knife as well but like the McDonald video shows, he was not a threat to officers, activists said. “We’re still calling for justice. We’re quite frankly fighting off the triggers, the reminders from last year. We remember these season greetings signs and remember seeing the cars set on fire right here. We remember seeing rappers and images of police officers with rifles. But today we come as a people to reconnect. We come together to remind ourselves of the struggle. We come together to touch again this sacred place where the ambers of justice and freedom were lit more than a year ago where democracy was on fire, quite frankly. We come to reconnect every time we have one of these occasions to remind each other that we love each other in this fight and that we’re supporting each other and we got a lot of work to do,” said Rev. Wilson. “We are not out here smiling, we not out here for any type of a party celebration. We’re out here because we want the world to know that we are still fighting and we stand with Chicago. We stand with Minneapolis. We stand with Mizzou. We stand with places all over the country. 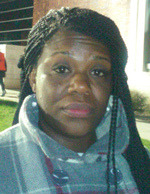 If we don’t get no justice they don’t get no peace,” said Pastor Cori Bush. The commission released a report with recommendations on Sept. 15 but its work has been extended until Dec. 31. The additional work will focus on how to make recommendations real, selection of organizations to provide research and services and putting accountability methods in place, said Rev. Wilson. He added that he wants the report to have a real impact—and not be just another lifeless document.